Her line is the winner in a global poll to pick both the best Hollywood movie lines of the past year (2013) – conducted across eight English-speaking countries by Badoo.com (www.badoo.com), the world's largest social network for meeting new people. Second place in Badoo's poll goes to George Clooney for a line in Gravity, delivered when his fellow astronaut Sandra Bullock looks to him in terror for her life and he responds, I know you never realized how devastatingly good- looking I am. But I need you to stop staring and help me with the tether. Third is a line from the movie Rush, where Daniel Brühl as racing driver Niki Lauda says, Happiness is your biggest enemy. It weakens you. Puts doubts in your mind. Suddenly you have something to lose! The Amy Adams line from American Hustle, observes the writer David Disalvio, is a rephrasing of the thinking distortion known in psychology as all-or-nothing thinking. As a con artist skilled at conning money from the desperate, Adams' character knows that desperation fuels desire but cannot spot the same condition in herself. Clooney's line, on the other hand, is just a piece of classic Clooney – a witticism delivered under pressure of a kind that would make less suave men crack. And the winner was the line, Marvin, is that a stick of dynamite in your pocket? – delivered by Bruce Willis as Frank to John Malkovich as Marvin in the action comedy, Red 2. The fact that Red 2 was meant to be tongue-in-cheek did not seem to excuse it. Second place went to a line delivered by Jonathan Pryce as the President in the G.I. Joe: Retaliation: They call it waterboarding, but I never get bored. George Clooney placed fourth, with a line referring to his spaceship in Gravity: "You point the damn thing at Earth – it's not rocket science". The stars who deliver such lines are not, of course, normally the same folks who write them. 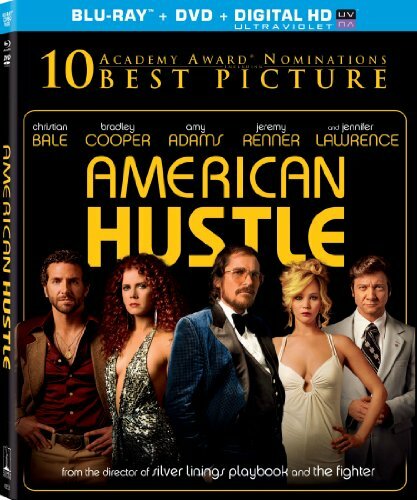 The screenplay for American Hustle is written by Eric Warren Singer and David O. Russell, the movie's director, and is itself nominated for the Best Original Screenplay Oscar®. The best movie lines enter our shared culture and memory: I'm gonna make him an offer he can't refuse (Marlon Brando in The Godfather); Here's looking at you kid (Humphrey Bogart in Casablanca); Go ahead, make my day (Clint Eastwood/Dirty Harry in Sudden Impact). In 2005, the American Film Institute (AFI) asked 1,500 film experts to pick the 100 most memorable movie quotes of all time. And the winner was Frankly, my dear, I don't give a damn, delivered by Clark Gable in Gone With the Wind. The AFI's list of winners suggests at least two things: first, that the best lines tend to be short and that they often rely for impact on context and character. Maybe it also suggests that they don't write great movie lines like they used to. Even back in 2005, almost all the best lines were over 30 years old. • The Best Movie Lines: And The Winners Are... 1. You're nothing to me until you're everything. 3. Happiness is your biggest enemy. It weakens you. Puts doubts in your mind. Suddenly you have something to lose!– Daniel Brühl as racing driver Niki Lauda in Rush. 4. "Who the hell is Julius Caesar? You know I don't follow the NBA! 6. "Who do I have to sleep with around here to get a Stoli martini with a twist of lemon? "– Cate Blanchett as down-at-heel socialite Jasmine in Blue Jasmine. "OSCAR®, OSCARS®" and ACADEMY AWARDS® are trademarks owned by the Academy Awards of the Academy of Motion Picture Arts and Sciences. Badoo polled 1,000 users in February 2014 across eight English-speaking countries: U.S., Canada, UK, Ireland, South Africa, Nigeria, Australia and New Zealand. Respondents were asked to vote on a list of lines from Hollywood movies in 2013, nominated by Badoo after extensive research. Badoo was launched in 2006, and is now one of the leading social networks in Europe and South America. It has over 200 million users, with over 100,000 more signing up every day. People use Badoo to find new friends in 191 countries and 44 languages. Badoo has 250 employees and is based in London, with offices also in Moscow and San Francisco. For more information visit www.badoo.com.